For that reason, the report released earlier this month by Borrell Associates — “The Future of Legacy Media” — should be required reading for everyone responsible for the health and sustainability of any legacy media business in the United States and Canada. And for those elsewhere, the executive summary would make excellent reading as a directional indicator of what’s sure to happen around in the world. In this latest report, Gordon — and Kip Cassino, its principal author — have outdone themselves. They’ve produced five-year projections for a long time, but this is the first time they’ve set out to describe specifically what these mean for the future of each of the legacy media. For legacy media, I see four huge takeaways in this report. 1. We’ve been losing audience share at a devastating pace, and it will continue. The introduction focuses on the foundation on which all media businesses rest — audience attention. 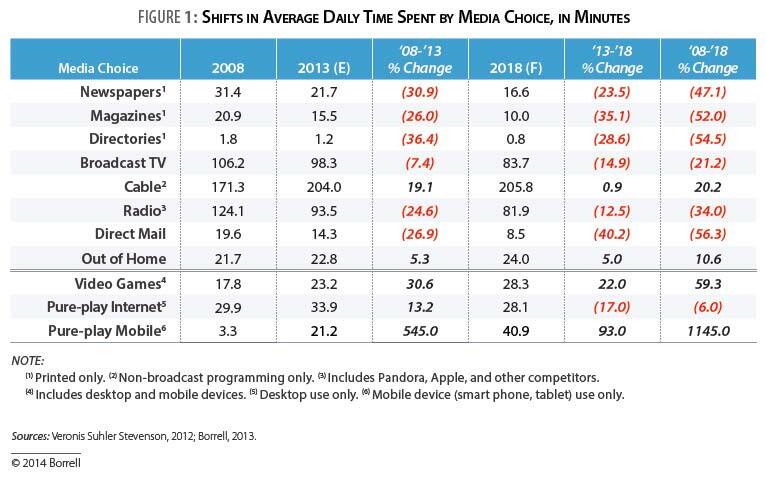 It shows the huge declines in time spent by audiences with each of the legacy media (except cable and outdoor) over the last five years, and it forecasts even bigger losses for each medium over the next five years. Audience attention is a crucial measure for media businesses . Over the last century, the legacy media’s massive grip on the public’s attention has enabled us charge high dollars for advertising, producing enviable profit margins. And now, as we lose huge amounts of public attention time to digital media, the ad dollars are leaking away to our digital competitors. So let’s stop and absorb the full impact. Newspapers, magazines, directories and direct mail, you’re going to lose half or more of your audience time from 2008 to 2018. Broadcast TV, you may have thought you were safe. But here it comes — Broadcast TV will lose about 15% of it audience time in just the next five years. Meanwhile, the digital media are picking up what we’re losing and turning it into ad dollars. Do I believe Borrell’s forecasts here? Absolutely, within a few percentage points. Legacy media thrived in the era when information was scarce. Now information is multiplying exponentially each year, moving rapidly toward infinity. With so many other choices available to people, the legacy media will be losing audience share for many years into the future. Does anyone believe this won’t have huge impact on revenues? 2. In revenues, the next five years won’t be so bad for legacy media. Considering No. 1, this seems utterly illogical. But Borrell’s research indicates that the massive revenue losses of the recent recession will ease off from here to 2018, producing a period of relative comfort for old media. In the medium-by-medium section of the report, the report predicts a little up, a little down for newspapers, broadcast TV and radio over over the next five years, generally about even. It sees cable doing a little better, while directories and direct mail do quite a bit worse. I follow Borrell’s logic here, but I’m not as optimistic. Most newspaper companies were still reporting high single-digit ad revenue declines, or worse, in 2013. I can believe that this will ease off a bit as marketers regain some faith in the effectiveness of legacy media, but flat or slight increases seem unrealistic to me. However, if Borrell is right and I’m wrong, I’m very worried. Our audience-based business model is coming apart at a rapid pace, as No. 1 shows. Take away the pain of intense revenue loss, and I fear that legacy media operators will ease off in their efforts to create their own new, disruptive business models. And if they do that, they’ll be caught flat-footed in the next wave of revenue losses, which will be driven by their loss in audience share. 3. Legacy media will increase digital sales but lose huge amounts of market share. To newspapers and, more recently, to broadcast TV operators, digital has been the big hope. And they’re not wrong about that, as Borrell’s projections show digital ad spending in local markets more than tripling from 2013 to 2018, going from $24 billion to $81 billion. But amid that whopping growth “propelled by exploding mobile and social use,” Borrell forecasts that legacy media won’t be able to keep up in their ability to sell it. They will lose massive amounts of digital market share to all-digital companies — “pure-plays.” In 2013, Borrell tracked legacy media’s digital advertising market share as a healthy 52% of local spending. In 2018, they’re projecting that pure-plays will own more than 88% of the local digital advertising market, while legacy media control only 12% of it. Even worse: “Sometime in 2017, online media will control more than half of all local advertising dollars.” (Emphasis supplied.) And legacy media companies may not even notice, because their own digital sales are likely to be going up. 4. With this five-year scenario, it’s imperative to innovate outside the legacy business model at a rapid pace. Invest some of that cash flow to innovate like crazy on the audience side. Retool our definitions of news to make our content more personally relevant, actionable and engaging (e.g., “The greatest show on earth). Get ridiculously creative about non-news possibilities in local markets by creating new, passion-centered platforms for non-news local content. Kids, family, entertainment, faith, food, shopping, fun, photo-sharing — these are just a few of the rich and largely untapped local-market opportunities. Invest some of that cash flow to innovate like crazy on the sales side. A growing number of legacy newspaper companies are realizing they can’t get the digital sales job done with their legacy sales teams. They’re creating separate, digital-only sales structures that are selling the whole range of digital solutions — not just the legacy website. This is a huge step in the right direction; we have many years of proof that we can’t keep up with the growth in digital spending with our legacy sales teams alone. If we also push to the ambitious goal of calling on every business in the market at least once every 12 months, maybe we can hold onto a bigger share of the skyrocketing digital spending that local businesses are and will be doing. I’ll close with one more plug for the Borrell report. Gordon graciously authorized me to share parts of it in this blog, but if you’re in a position of leadership at a legacy media company, you need to see the whole report and draw your own conclusions. If you’re a Borrell customer, you can download it and read it for free. But far too many Borrell customers don’t do that — this time, make sure you do. If you’re not a Borrell customer, it will cost you $995. That sounds like a lot, until you compare it to the amount of money you stand to lose in the next five years if you don’t navigate your legacy business in the right directions. Spend the money, read the report and take action. Posted on January 21, 2014, in Advertising, Audience, circulation, Consumer revenue, Content, Disruption, innovation, investment, Magazines, Media business model, Newsrooms, Revenue, Sales and tagged audience share, Borrell Associates, digital media sales, Future of Legacy Media, media market share, media sales model. Bookmark the permalink. 7 Comments. Agree completely with Borrell’s view. If anything I’m more pessimistic about broadcast media and traditional cable companies than print media. Not only have our kids, who are now starting their own households, abandoned land lines and newspapers. They are also abandoning cable subscriptions. They only pay for fast internet, and get everything else streamed through that pipe. If they can’t live without live sports, they either buy an antenna for their TV, trade their netflix login with a friend who has a comcast login, or head to the local sports bar. Excellent analysis. Just curiously, in Figure 1, which category would a legacy media’s digital audience fall into? It does not seem to be accounted for. Many local newspapers have far and away the biggest local digital audience for news. That’s potentially a big advantage to leverage while the window still exists. Also, projected audience for mobile and cable indicates local media companies have a huge opportunity to develop low-cost video programming. Borrell’s footnote on that table says the newspaper figures are for print only. You’re right, newspapers tend to have the biggest local audiences for news. But the problem is, that’s too narrow a measure. Newspaper websites usually beat local TV and radio station websites, but they fall far below the local digital audiences shares of the big national players. A newspaper news site typically ranks somewhere between No. 15 and No. 20 in number of visits from local users, compared to the giants. In Morris markets, where our sites are pretty good performers on the web, Google gets around 40 times the monthly visits that our sites do. The other biggies — Facebook, YouTube, Yahoo, etc. — also swamp us, and even sites like Wikipedia and Amazon outrank us by wide margins. It’s important for us to realize we are losing this competition, because most of the Web giants that are beating us are also selling more and more digital advertising to business in our markets. That’s why, in No. 1 above, I call on newspaper companies to innovate like crazy on the audience side by offering new kinds of content beyond news. We just can’t be competitive enough with news alone.